This chapter investigates the factors that have contributed to successful e-enablement within Irish SMEs. These factors are categorized as organizational, management, and implementation factors. The organizational factors that contribute to such success include previous organizational IT expertise, previous experience with logistics, and the suitability of the product for sale on the Web. The management factors that have a positive influence on success include the existence of a champion, having an e-commerce strategy, and integrating the Web presence into the existing business. The implementation issues that contribute to success include planning the Web presence, usability of the website, the existence of security features on the website, outsourcing elements of the e-commerce project, and website marketing. 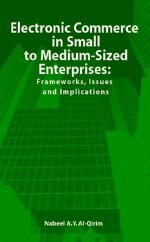 The authors purposefully chose to study recognized successful e-enabled SMEs so as to identify the salient factors and explore how these factors contributed to the success of the SMEs e-commerce initiative.